Climb and cruise chart information is based on actual flight tests conducted in an aircraft of the same type. This information is extremely useful when planning a cross-country flight to predict the performance and fuel consumption of the aircraft. Manufacturers produce several different charts for climb and cruise performance. These charts include everything from fuel, time, and distance to climb to best power setting during cruise to cruise range performance. The first chart to check for climb performance is a fuel, time, and distance-to-climb chart. This chart gives the fuel amount used during the climb, the time it takes to accomplish the climb, and the ground distance that is covered during the climb. 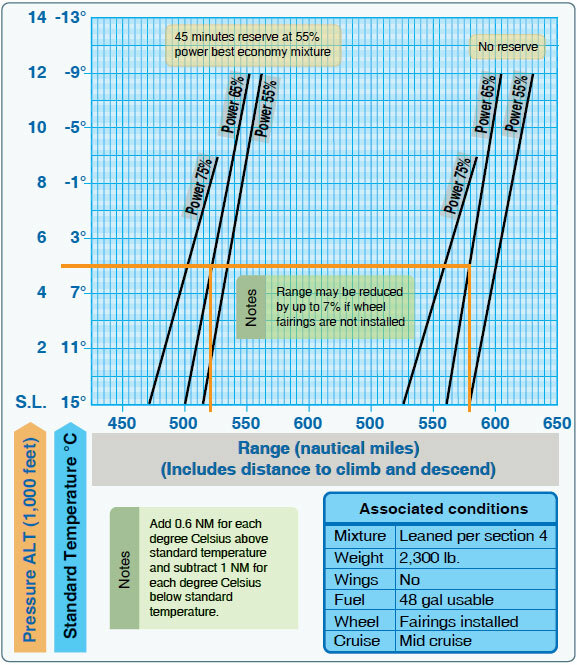 To use this chart, obtain the information for the departing airport and for the cruise altitude. 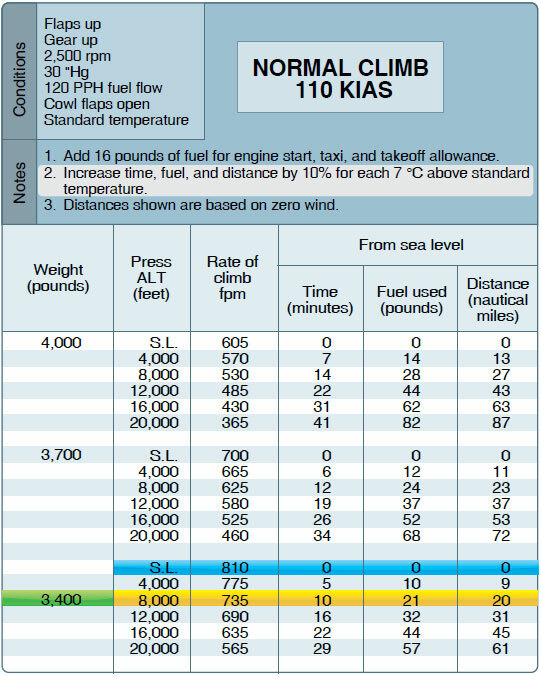 Using Figure 11-25, calculate the fuel, time, and distance to climb based on the information provided. First, find the information for the departing airport. Find the OAT for the departing airport along the bottom, left side of the graph. Follow the line from 25 °C straight up until it intersects the line corresponding to the pressure altitude of 6,000 feet. Continue this line straight across until it intersects all three lines for fuel, time, and distance. Draw a line straight down from the intersection of altitude and fuel, altitude and time, and a third line at altitude and distance. It should read three and one-half gallons of fuel, 6 minutes of time, and nine NM. Next, repeat the steps to find the information for the cruise altitude. It should read six gallons of fuel, 10.5 minutes of time, and 15 NM. Take each set of numbers for fuel, time, and distance and subtract them from one another (6.0 – 3.5 = 2.5 gallons of fuel). It takes two and one-half gallons of fuel and 4 minutes of time to climb to 10,000 feet. During that climb, the distance covered is six NM. 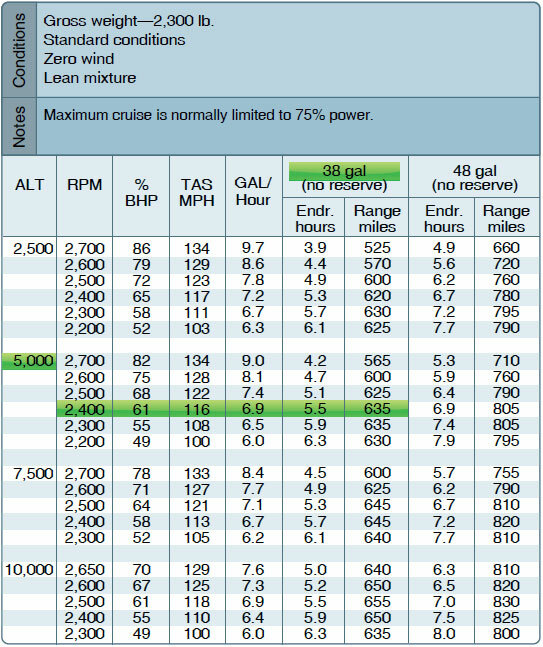 Remember, according to the notes at the top of the chart, these numbers do not take into account wind, and it is assumed maximum continuous power is being used. The next example is a fuel, time, and distance-to-climb table. For this table, use the same basic criteria as for the previous chart. However, it is necessary to figure the information in a different manner. Refer to Figure 11-26 to work the following sample problem. Figure 11-26. Fuel time distance climb. To begin, find the given weight of 3,400 in the first column of the chart. Move across to the pressure altitude column to find the sea level altitude numbers. At sea level, the numbers read zero. Next, read the line that corresponds with the cruising altitude of 8,000 feet. Normally, a pilot would subtract these two sets of numbers from one another, but given the fact that the numbers read zero at sea level, it is known that the time to climb from sea level to 8,000 feet is 10 minutes. It is also known that 21 pounds of fuel is used and 20 NM is covered during the climb. However, the temperature is 22 °C, which is 7° above the standard temperature of 15 °C. The notes section of this chart indicate that the findings must be increased by ten percent for each 7° above standard. Multiply the findings by ten percent or .10 (10 × .10 = 1, 1 + 10 = 11 minutes). After accounting for the additional ten percent, the findings should read 11 minutes, 23.1 pounds of fuel, and 22 NM. Notice that the fuel is reported in pounds of fuel, not gallons. Aviation fuel weighs six pounds per gallon, so 23.1 pounds of fuel is equal to 3.85 gallons of fuel (23.1 ÷ 6 = 3.85). The next example is a cruise and range performance chart. This type of table is designed to give TAS, fuel consumption, endurance in hours, and range in miles at specific cruise configurations. Use Figure 11-27 to determine the cruise and range performance under the given conditions. Figure 11-27. Cruise and range performance. Find 5,000 feet pressure altitude in the first column on the left side of the table. Next, find the correct rpm of 2,400 in the second column. Follow that line straight across and read the TAS of 116 mph and a fuel burn rate of 6.9 gallons per hour. As per the example, the aircraft is equipped with a fuel carrying capacity of 38 gallons. Under this column, read that the endurance in hours is 5.5 hours and the range in miles is 635 miles. Cruise power setting tables are useful when planning crosscountry flights. The table gives the correct cruise power settings, as well as the fuel flow and airspeed performance numbers at that altitude and airspeed. Refer to Figure 11-28 for this sample problem. First, locate the pressure altitude of 6,000 feet on the far left side of the table. Follow that line across to the far right side of the table under the 20 °C (or 36 °F) column. At 6,000 feet, the rpm setting of 2,450 will maintain 65 percent continuous power at 21.0 “Hg with a fuel flow rate of 11.5 gallons per hour and airspeed of 161 knots. Another type of cruise chart is a best power mixture range graph. This graph gives the best range based on power setting and altitude. Using Figure 11-29, find the range at 65 percent power with and without a reserve based on the provided conditions. Figure 11-29. Best power mixture range. First, move up the left side of the graph to 5,000 feet and standard temperature. Follow the line straight across the graph until it intersects the 65 percent line under both the reserve and no reserve categories. Draw a line straight down from both intersections to the bottom of the graph. At 65 percent power with a reserve, the range is approximately 522 miles. At 65 percent power with no reserve, the range should be 581 miles. The last cruise chart referenced is a cruise performance graph. This graph is designed to tell the TAS performance of the airplane depending on the altitude, temperature, and power setting. Using Figure 11-30, find the TAS performance based on the given information. Begin by finding the correct OAT on the bottom left side of the graph. Move up that line until it intersects the pressure altitude of 6,000 feet. Draw a line straight across to the 65 percent, best power line. This is the solid line, that represents best economy. Draw a line straight down from this intersection to the bottom of the graph. The TAS at 65 percent best power is 140 knots. However, it is necessary to subtract 8 knots from the speed since there are no wheel fairings. This note is listed under the title and conditions. The TAS is 132 knots.